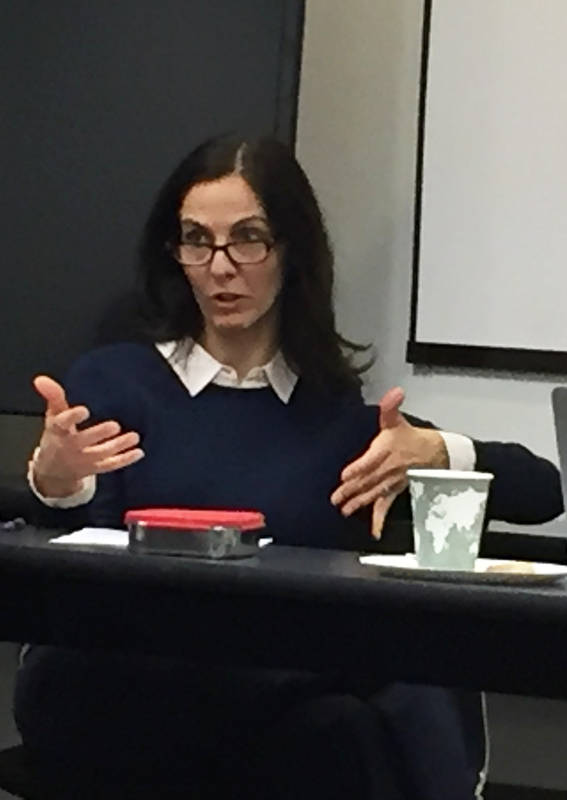 On October 17th, Professor Alice Weinreb of the Loyola University History Department led an excellent roundtable on women’s history research at the Crown Center on Loyola University’s Lakeshore Campus. Professors Tanya Stabler and Elizabeth Fraterrigo and PhD candidate Ruby Oram, all also of Loyola, presented on their research. The event included spirited conversation among the guests and delicious snacks from the Middle East Bakery and Grocery in Andersonville. While the subjects of the research differed in era and geographic focus, each spoke to the thorny question: what constitutes a women’s movement, especially in the absence of explicitly feminist institutional structure? 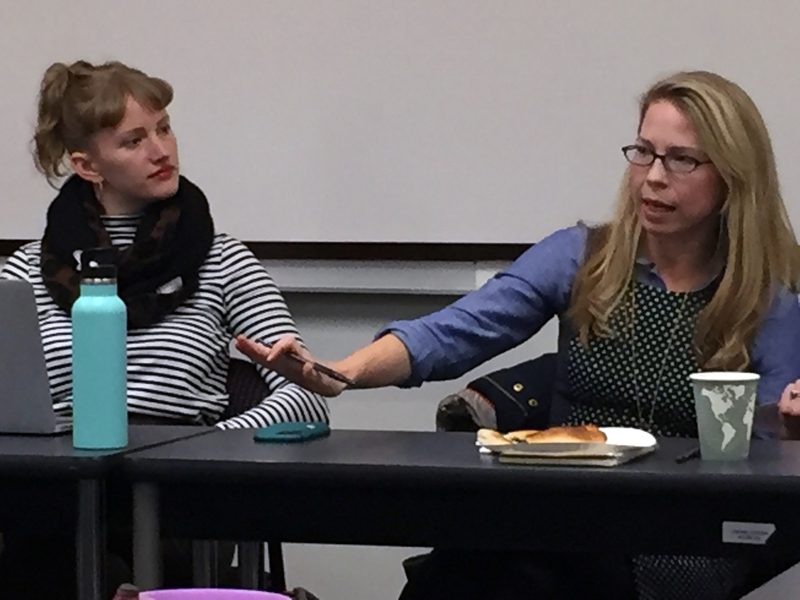 After a few introductory comments from Professor Weinreb, Professor Stabler discussed her research on the Beguines, a lay order of women in medieval Paris. Inspired to works of piety and charity, these women took temporary vows and self-identified as religious, but mostly existed outside the control of canon law and a patriarchal monastic structure that often saw independent women as a threat to male leadership. Fascinating and compelling, these women were neither nuns nor “normal” women. While much of the literature on the era focuses on official orders or notable nuns like Saint Clare of Assisi, Stabler focuses on the innovations of the Beguines while investigating them as a compelling women’s movement despite their lack of formal recognition. PhD Candidate Ruby Oram (left) and Professor Tanya Stabler. Next, Ruby Oram discussed her dissertation research on vocational education of young ladies in Chicago between 1880 and 1930. Much of the literature on Progressive-Era education focuses on industrial training for boys, but Oram notes that vocational training for girls preceded and even inspired similar programs for male students. Vocational education for young ladies took three forms: traditional craft skills like sewing and hat-making, white-collar labor like typing and stenography, and domestic education for modern home-making. Oram argues that Progressive reformers saw education for girls not just as an economic tool but also as a solution to social ills such as child labor, sexual delinquency, broken families, etc. Although the women spearheading these programs may not have identified as feminists or gender activists specifically, Oram sees their work as a women’s movement because women were organizing at the official level to influence law and policy. Professor Elizabeth Fraterrigo outlined her work on the National Organization for Women in the 1960s-1980s and their work to change the culture through media, shaping and controlling representation to encourage gender equality. This program and other feminist projects like it in the era are readily identified as women’s movements partly because the 1960s was the era of movements. But this led the roundtable to also discuss whether or not anti-feminist activists, like the late Phyllis Schlafly, were part of a women’s movement as well, just one of a strikingly different nature. Much of the current literature on women’s movements focuses on very structured groups of women led by “big names” like Betty Friedan or Saint Clare. Broadening our answer to the question “what defines a women’s movement?” may help scholars and educators elevate the voices of influential but non-institutional groups of women working to improve their local communities, either as part of their own projects or within the structure of another. It may also allow us to investigate the tensions between the advantages of institutional protection and organization versus the freedom of movements with fewer structural restraints. Snacks will again be provided. We at the Lakefront Historian highly encourage you to attend.